Going back to ancient times, the section of the Maghreb now called Algeria has been subjected to stagnating rule by a series of foreign empires. The Phoenicians, Carthaginians, Romans, Arabs, Spanish, Turks and French have all spent significant time as overlords there. History teaches us that wherever there are rulers, especially foreign ones, there are also those who oppose them. In the case of Algeria, the people of the Kabylia region, mostly Muslim Berbers, have historically resisted assimilation efforts from both foreign and domestic foes. In fact, their inability to coalesce politically and religiously with the country’s Arab Muslims has left the population at the mercy of foreign armies and domestic warfare for centuries. 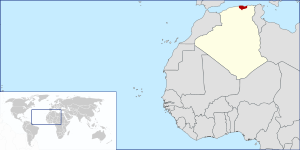 Algeria has been inhabited by Berbers since at least 10,000 BC. They have had a warlike reputation throughout history; they are chronicled as fighting the Pharaohs of Egypt and the Carthaginians; they provided two Roman Emperors; one of the most important figures in the development of Western Christianity, St. Augustine, was of Berber descent; they were in the vanguard of the Muslim conquest of Spain; and of course the name “Barbary Coast” is derived from the Berber people. Kabylia is a formidable mountainous region just east of Algiers. Its isolated mountains have provided safe haven for the local Berbers for centuries making it a difficult place for foreign occupiers and their religious and political practices to fully penetrate. Its cave rich landscape provides ideal cover from which to launch a guerrilla insurgency or to hold off an advancing army. The Kabyle Berbers historically fell back to these mountains under pressure from invading armies, for centuries they proved tremendously resilient in the face of the integration efforts of many a conquering empire. Considered clannish, these hill people have always behaved in a rebellious fashion when challenged. For example, though forcibly converted to Islam, they incorporated in their new religion many of the animist features of their pre- Islamic faith, to the dismay of orthodox Islamic religious leaders; in constant rebellion against centralized rule, they fought the tax man and the religious reformer with equal zeal. They were often on the brink of rebellion, yet their inter-clan rivalries made them vulnerable to central manipulation. The insurgency to repel the advancing Europeans was lost but Kabylia kept up resistance for years. Worth mentioning during this period is the legendary Kabylie named Lalla Fatma N’Soumeur. In 1849 she met the resistance leader Boubaghla, a soldier in Abd-el-Kader’s vanquished army who had fled to Kabylia rather than surrender to the French. N’Soumeur was present alongside Boubaghla at the victorious battle of Tachekirt in 1854, the high water mark of the resistance. She was also one of the last rebels to surrender to the French when they finally crushed the rebellion in 1857. Lalla Fatma N’Soumeur has become known in Algeria’s national memory as the “Jeanne d’Arc du Djurdjura” for her role in the Kabylia uprising. The confrontation between Algerians and the French colonists continued to heat up; as French settlers seized more power and land native Algerians found themselves increasingly powerless to shape thier own political and economic destiny. A fateful moment arrived with the end of the Franco-Prussian War in Europe in 1871. The annexation of Alsace-Lorraine by the Germans, one of the spoils of their victory over the French, created hundreds of thousands of French refugees many of whom emigrated to the new French colony in northern Africa. This mass infusion of foreign settlers set the country on a dangerous path that ultimately led to revolution. But it took awhile because the Algerians themselves suffered from devastating in-fighting between rural and town, between Arab and Berber and between orthodox Muslims and more secular leaning Muslims. Despite the hard feelings Arabs and Berbers slowly built a détente and began to work together. At the close of the second world war an important incident occured that jump-started the solidarity movement, it took place in the rural, mostly Muslim, town of Setif in the interior. On May 8, 1945, V.E. Day, the victory celebration there quickly turned to protest over long-simmering grievances; Muslims rightly expected equal citizenship and voting rights after fighting and dying on the battlefield in support of the French cause twice in thirty years. For decades the French governors had steadfastly refused their demands. The colonial authorities feared the potential of a radicalized Algerian majority and so moved quickly to gain control over the threatening situation to keep it from escalating. The result was the tragic massacre of hundreds of marchers, many from nearby Kabylia, by the colonial police. The explosive reaction was brutal; for several days the Europeans of the Kabylia and Setif areas lived in fear of angry marauding Muslims who terrorized the countryside. The French repression in return was ferocious, hundreds died before the French brought the situation under control. The action served the immediate goal of the French authorities as it temporarily crushed and demoralized any potential opposition. In the long run though, the memory, seared into the minds of the people, Arab and Berber alike, became a rallying cry as the momentum built toward the war for independence in 1954. In addition, the episode provided grounds for the future rebels to justify jihad in defensive terms, like the Prophet had, by using the memory of Setif as proof of French motives. By October 1954 most residents of the Kabylia region had little contact with the French colonial settlers or administrators. True, there were European settlers in Kabylia but they tended to stay together. In fact, most Kabylies rarely ever saw pieds noirs in their remote villages. Most likely, the only time they ever had contact was with the dreaded tax collector from Algiers. Hating the tax man was nothing new in world history and the residents of Kabylia were no different. They had serious issues with the colonial practice of taxation without representation. Sound familiar? They also experienced the pain of serious economic disadvantages they viewed as unfair and as originating in Algiers, where the Europeans lived; in fact the tension between urban and rural populations was an important factor in the lead-up to the war and remains potent to this day. In towns, universal education was within sight, whereas in the country it remained a dream. Rural dwellers had a direct knowledge of certain advantages—education, political rights, social mobility—which they had no real hope of sharing. The situation proved to be fertile ground for producing combatants in the rebellion prone region. The F.L.N, or Front de Liberation Nationale, had grown from several competing organizations in the years following the Setif massacre. Its evolution into the leading Algerian political force had been a dangerous, bloody internal struggle. But by 1954 events had unified many, Arab and Berber alike, within the party apparatus. Some of the most influential members during the revolutionary life of the F.L.N were from the Kabyle. Even so, the F.L.N did have rivalries, not surprisingly the first important power struggle in the party was between the Arab Ahmed Ben Bella and Ramdane Abbane from Kabylia; in fact the mystery surrounding Abbane’s violent death has led many to believe he was liquidated by Ben Bella’s faction within the F.L.N..
On October 10, 1954, the F.L.N set the plan in motion for the beginning of the war for independence from France. On November 1, 1954 “All Saints Day” the revolt was launched in the interior, namely the Kabyle and Aures zones. Alistaire Horne points out that the F.L.N voiced their disenchantment with fighting for equality within the French colonial administrative and judicial structures. All Saints Day represented a new strategy, a violent one to be sure, that aimed to take the struggle first to the countryside to build and recruit an army from the poor, largely ignored, populations. We should not be surprised that the Algerian war for independence began in the Kabyle first. No insurrection against the French could ever succeed without the participation of the tenacious hill people. The formation of the F.L.N represents the emergence of a true Algerian nationalist effort, the first since al-Kader. The Algerian War proved to be a long, tragic struggle– thousands lost their lives. Finally Charles de Gualle offered the famous “paix des braves” (peace of the brave) signaling the hand-writing on the wall. The F.L.N had won. The actual capitulation and retreat by France in 1962 caused the mass evacuation of hundreds of thousands of pieds noirs back to France. The collaboration between the Arabs and Berbers, admittedly messy in its execution, had proved to be the difference as the Algerians finally repelled the foreign occupier and grabbed hold of their own national destiny. A destiny that we shall see has been increasingly murky as the two groups have again diverged. In the late 1980s another reformist movement developed; known as the FIS (Islamic Salvation Front) their platform caused renewed tensions between Arab Islamists and rural Berbers. The FIS stood for an Islamic constitution based on the shura (the method by which pre-Islamic Arabian tribes selected leaders and made major decisions) and the Shari’a (Quranic law). On the other hand, the Berberist RCD party and Kabylia’s FFS party led by Ait Ahmed stood for a secularist constitution based on democratic principles. The differences escalated as time progressed, sometimes turning bloody. To conclude, throughout Algerian history Berber struggles for autonomy, religious and regional, served to forestall pan-Muslim and nationalist movements. As we have seen the bar for unification between Muslims was set quite high; it took the introduction to Algeria of close to one million foreign French colonists (the pieds noirs), decades of 2nd class citizenship in their own land and dashed expectations after fighting and dying in two world wars to push the two Muslim populations into an uneasy alliance against their antagonists. The success of Islamization in Kabylia had been mixed, but they were Muslims and so open to the call for jihad, especially after Setif. In fact the leaders of the F.L.N used the traditions of the Prophet Muhammad to unify their forces in opposition; the F.L.N leaders no doubt knew the symbolism of framing the insurrection in the language of the hijra (the emigration of Muhammad and his followers to the city of Medina in 622) and jihad performed by the Prophet Muhammad’s original community. By retreating to the interior, to the caves of the Kabyle, to launch the rebellion the F.L.N seemed to be following in ancient footsteps. Finally, the trend was reversed after the French retreat removed the reason for cooperation. The effect was a breakdown of alliances between the rural, mostly Berber, occupants of Kabylia and the urban fundamentalist Islamists, the Armed Islamic Group for example, that once again threatened to tear the fabric of the country. Edward Behr. The Algerian Problem. New York, W.W. Norton. 1962, c1961, p.13. The most fighters in Algerian war against the french were from kabylia…the other Algerians specially oran region there were surprised to hear about the war ( wash bihoum zwawa m3a lgwar) means what is the problem between the Kabyle and the french. After independence the arabsArabs fighters ( they never fought against the french ) they was in Tunisia and Marocco…they entered Algiers with there tanks and heavy weapon crached the kabylians 500 kabylians died killed in just two weeks . Ait Ahmed was jailed for life. Krim belkacem was killed in Germany. 1980 the kabylia region uprised against the regime and demanding stop of forced arabisation and the right to learn and to teach the berber language. The respons of the regime was torture and prisons for the activists. 1985 kabylian activists founded the first human rights league. Again the regime arrested the human rights activists . 1990 the regime helped the Islamist movement to gain access to hight state institutions just to stop the Kabylians to get elected. 1992 the Islamist movement started kiling and destruction to any one stood against their project .the kabylians again they were the first to fight this salafists groups. Now the kabylian activists founded a movement simply asking a divorce a separation an independance from Algeria . The leader is ferhat mheni once was behind the creation of the human rights league. Today he founded GPK in Paris where he is refugee since 2007.